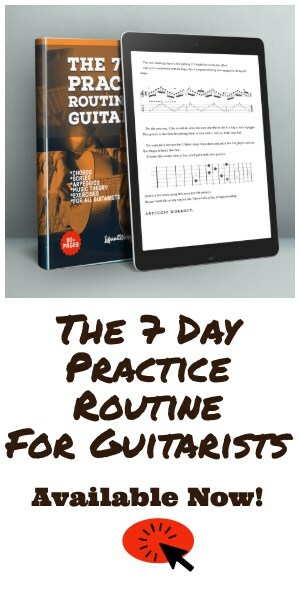 My wife Celeste came up with the idea for this article. Halloween is probably our favorite time of the year, or at least a close 2nd to Christmas time. As usual, she’s getting started on the Halloween shopping early. Pumpkins and decorations are already showing up in the stores and my Amazon Prime account is about to get blow’d up with purchases. We love the Fall here in Florida. Contrary to popular belief, the leaves DO change somewhat and we get a nice break from the heat that lasts until March. Sure, being from Ohio we know it’s not the idyllic postcard Fall scene, but we love it nonetheless. I’m already looking forward to making my world famous (well, maybe just among friends) Chili and decorating the house inside and out. These days I try to get Halloween Night off. I’ve done my fair share of gigs and costume parties and now I just wanna be home with my Wife, friends and 4-legged kids. We usually have a few friends over, have a few beers, play games and take turns passing out candy to the kids. Our neighborhood is one of those middle-class, suburban spots that seems to attract Trick-Or-Treaters from all over Sanford, FL. It’s super fun to open the door and let our 4 Chihuahuas interact with the kids. It’s even more fun to dress them up for the occasion. We use a big Pet Gate to block off the dogs at the front door so we can deal out the treats without worrying about them running out of the house. This system seems to work well, and the Trick-Or-Treaters get a kick out of seeing the pups. Typically I’ll make two batches of chili on Halloween…a mildly spicy batch for everyone…. and a spicier pot that has caused several friends to berate me via text the following morning. Hey, you were warned. That’s why I make two different batches. It never stops being funny. Making Chili has really become a Halloween tradition in the Smith household. As it gets a little closer to October 31st, I’ll have to post my recipe which seems to be an ever changing, evolving thing… but it’s always great! 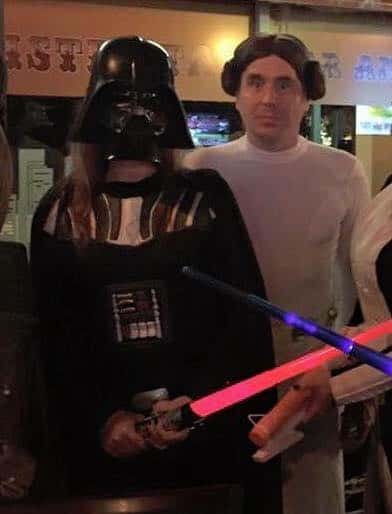 One thing that never changes here is our love for Halloween. We love to decorate the house inside and out. We’ve accumulated an ever growing pile of Halloween stuff in our 21 years of marriage. Our Halloween stash is starting to finally rival our insane amount of Christmas stuff. My garage is literally exploding with overstuffed totes stacked to the ceiling with Celeste’s impulse buys on shopping sprees with her mom. (Ok, I’ve been known to do the same as well). Maybe you can relate to this festive Halloween spirit? 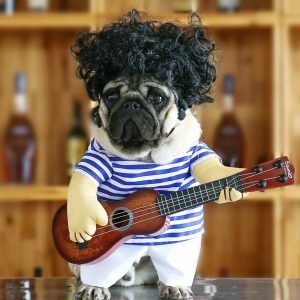 If you have a few dogs or even a cat, you may have dressed them up in Halloween costumes in the past. 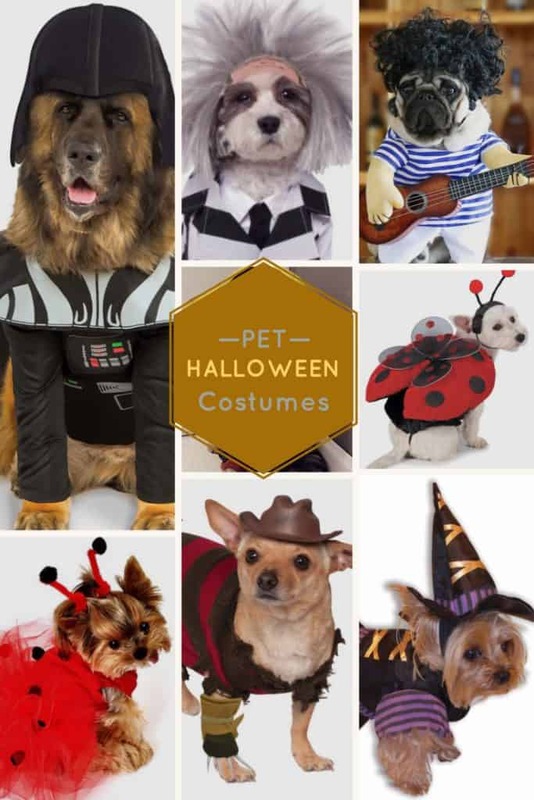 Thanks to the internet, particularly Pinterest, there are no shortage of great Halloween pet costume ideas out there. Yeah, to some it may seem silly or a bit eccentric, but to us pet lovers we have fun with it. No apologies! Of course you could be creative and make your own, but seriously, I’m not that crafty (and neither is Celeste). 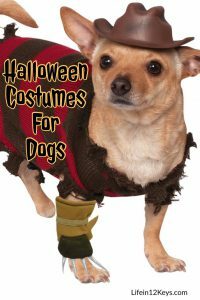 Pet Halloween Costumes are so inexpensive these days why not pick up a few or give them as gifts. 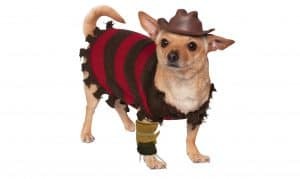 With this in mind, I’ve tasked Celeste with coming up with some budget-friendly Pet Halloween Costumes ideas. She has handpicked her favorites right from Amazon.com with links and pictures for each. 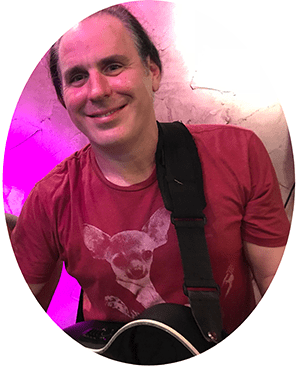 Commentary by yours truly… enjoy! If you’re of a certain age you probably agree with me that Star Wars anything never gets old. 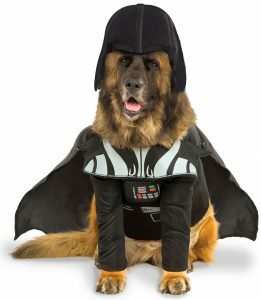 We dressed up our old Chow/Retriever mix Sammy in this exact costume a few years ago and it was hilarious. The headpiece didn’t last long, but he didn’t mind the rest of it. Classic! I’m definitely buying this one this year for our Chihuahua mix Yngwie. I’d love to have a companion outfit of Jason from Friday the 13th, but I doubt I could get any of my pups to tolerate a hockey mask. This is just amazing. I’m hoping our Abigail is just tall enough for this one. It would be well-suited to a Chihuahua, but the Pug looks adorable too. Casual Canine Glow-in-the-Dark Skeleton Zombie Dog Costume. Cute litte skull tutu and headpiece for your little one! On sale too. We can’t leave out the Kitties! 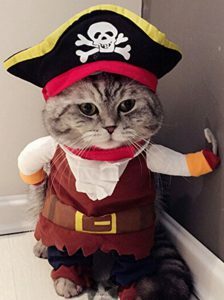 Check out this Pirate Dog or Cat Costume Suit.